In the preceding calculations used for arriving at the spring characteristics, it was determined that the velocity with which the gun reaches the firing position is 5.54 feet per second. However, when the bolt strikes the barrel and locks to it the resulting impact will cause this velocity to increase. 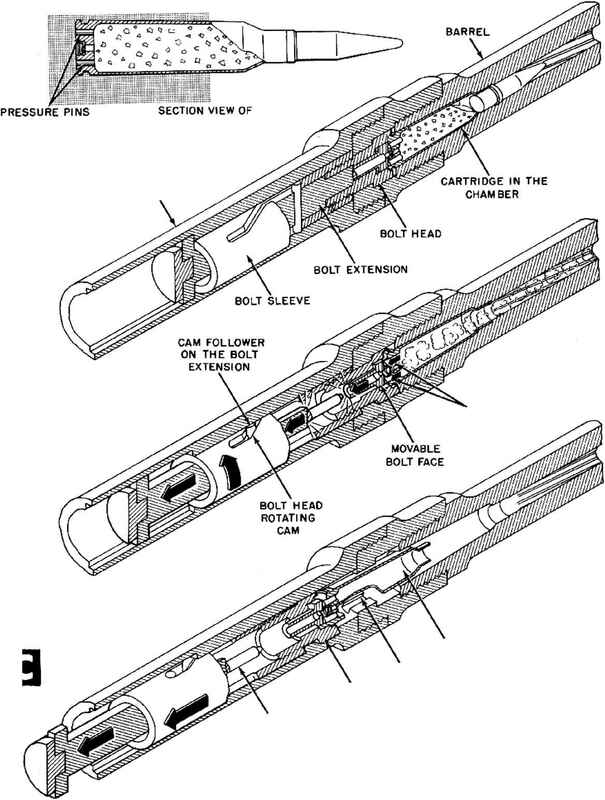 Since no information is yet available concerning the actual velocities of the gun and bolt at the instant of impact, it will be estimated for the present that the velocity increase is one foot per second and therefore that the gun will reach the firing position with a velocity of G.54 feet per second. When the cartridge in the chamber is fired, the impulse exerted by the pro-pcllant explosion must first cancel this velocity before the gun will start to move to the rear in recoil. The free recoil velocity curve given in fig. 3-21 shows the velocity which would be produced in the recoiling parts if the gun were not moving at the instant of firing. Another way of looking at this curvc is that, starting with zero velocity, it shows the change in velocity produced by the impulse of the propellant explosion. This same change in velocity would be produced, regardless of what velocity the gun possesses at the instant of firing. Since it has been determined that the gun is moving at a forward (negative) velocity of 6.54 feet per second when it is fired, its velocity at any instant after firing can be determined by simply drawing the same curve, starting at a velocity of —6.54 feet per second instead of from zero velocity. This has been done to produce the curvc shown in fig. 3-25. Note that the negative velocity of the gun decreases to zero at 0.00058 second indicating that at this instant the forward motion of the gun is halted. The gun is then driven to the rear (velocity positive). It is important to point out that the final free recoil velocity attained at the instant of unlocking is now much less than the final velocity that would have been attained if the gun were not moving when fired. This effect of using advanced primer ignition is highly advantageous because the reduction in recoil velocity results in a greatly reduced energy in the recoiling parts, thus simplifying the design of the recoil mechanism and permitting a lower trunnion reaction.